Article written in 2010. Last update March 2016. Mid 1980s - early 1990s - It is likely that some of Gilmour's guest solos on other artists songs from this period featured a Big Muff, although he mostly used a Boss HM-2 comboed with a Mesa/Boogie amp and a ProCo Rat in this period. *Note - for a very thorough and comprehensive guide to all of the gear David Gilmour used in these periods, look no further than Gilmourish.Com. Also check out the wonderful Tone from Heaven website for a comprehensive look at David's gear from the Division Bell-Pulse era, On an Island, and David's custom Pete Cornish effects rigs. David Gilmour Big Muff Sound Clips - Here is a selection of various Gilmour solos using the Big Muff Pi, in this order: Dogs solo live from Oakland California, Dogs solo from Animals studio album (both 1977), Mother solo, Young Lust solo, and Comfortably Numb solo (all from The Wall 1977), Final Cut solo and Fletcher Memorial Home solo (from The Final Cut in 1983), On an Island second solo (from On an Island 2006) and the intro to Sorrow (from A Momentary Lapse of Reason in 1987). 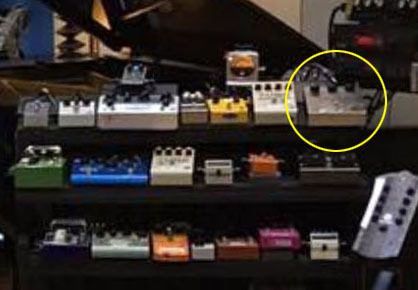 Shown above - David Gilmour's 2015 rehearsal pedal board with his first Big Muff from 1974, labeled with DG ORIGINAL. The red LED is an after-market mod. 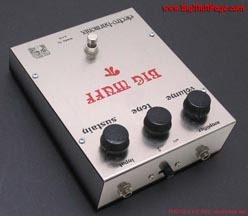 THE "DG ORIGINAL" BIG MUFF - According to Phil Taylor, that very first Big Muff Pi he gave to David "has often been preferred for most things" over others David owned. 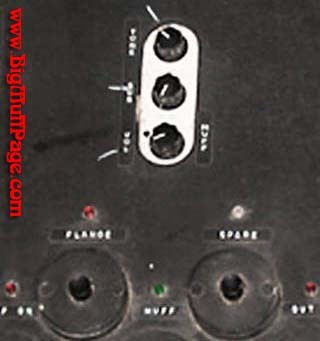 This original unit was likely David's main recording fuzz box from 1976-1983. It is often seen with the label DG ORIGINAL on top. In 1974 or 1975 Phil purchased another 1974 Big Muff for David to use on tour but it did not sound exactly the same as the original. He soon became aware that the component values of Big Muffs were not consistent from unit to unit, so Phil had that Muff modified to sound exactly like David's original. 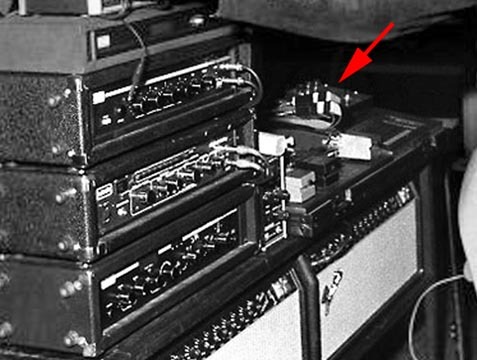 THE PETE CORNISH BIG MUFF MODIFICATIONS - In 1976 effects rig legend Pete Cornish created a new pedal board for David to use on tour, shown above (left) in a photo from the Animals song book that was taken during London rehearsals for the In the Flesh tour in late 1976. Pete was asked to modify the Big Muff David wanted to take on tour to get it up to modern standards. He replaced the potentiometers and foot switch with higher quality parts and and added a buffer to make it compatible with the routing system he designed and built into the pedal board. 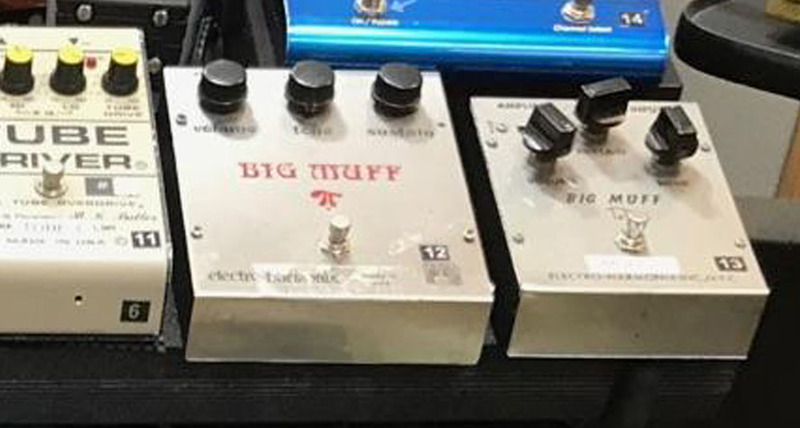 This "touring" Big Muff is the one shown in the photo above. If you look closely, you can the extra screw on top that holds the buffer in place inside the pedal, and a black foot switch, rather than the standard silver one. 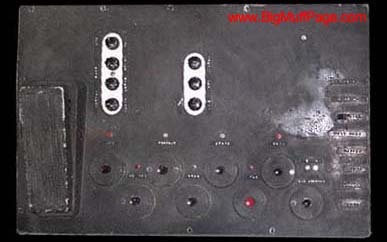 This exact same Big Muff was used on Pink Floyd tours from 1977 through 1988. 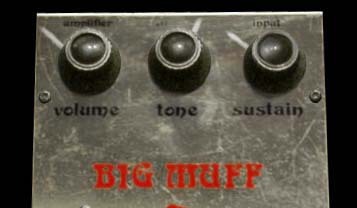 You will also note that this touring Big Muff features unique skirted knobs, similar to knobs used on the old Dallas Arbiter Fuzz Face pedal. 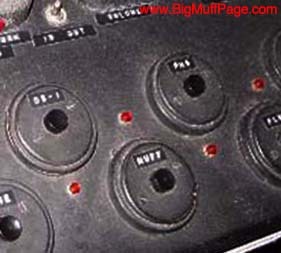 EHX used at least 10 different knob types on the V2 Big Muffs, but these were not one of those. Pete replaced the stock potentiometers with higher quality pots, but these new pots had round shafts. The original E-H knobs fit D shaped shafts, so they could not be used. Pete was using Fuzz Face style knobs that fit the round shafts in his effects rigs at the time, so David's Big Muff was fitted with those. 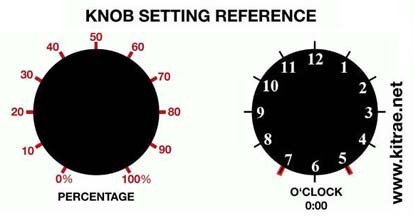 These same knobs can be seen in Brian May's Queen gear, and various other pedal boards Pete Cornish built for other guitarists at the time. • David's original 1974 Big Muff, first seen at the Bray studio rehearsals for David's 2006 On and Island tour, and used for the 2015/2016 Rattle That Lock tour - identified by the Fuzz Face style knobs, red LED, and DG ORIGINAL label on top. 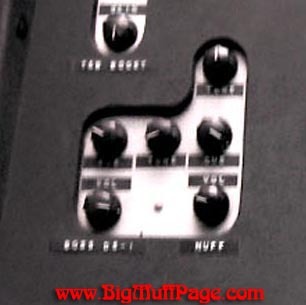 • The Big Muff used on tour from 1977-1988, identified by the black footswitch, Fuzz Face style knobs, and no LED. 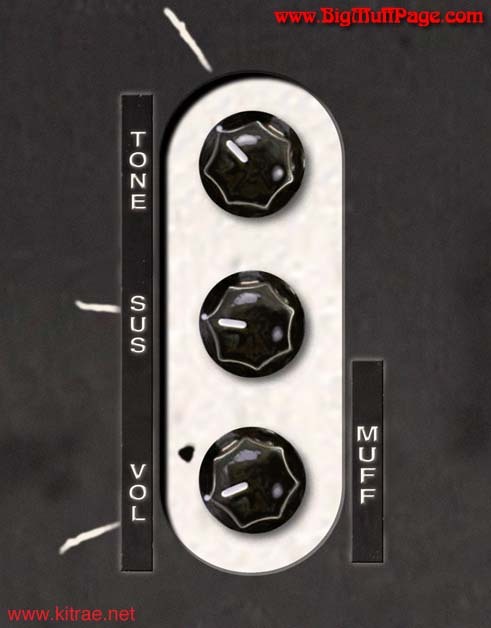 • The Big Muff displayed at Pink Floyd's Their Mortal Remains exhibition in 2017, identified by the standard footswitch, Fuzz Face style knobs, and no LED. 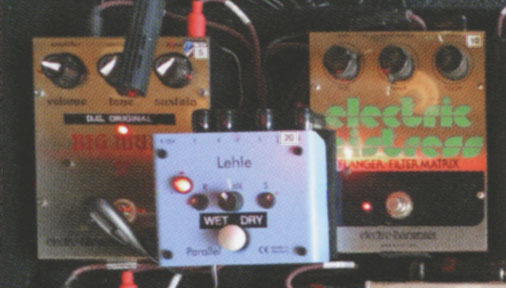 (right) David's original Big Muff (with DG ORIGINAL label), and a Triangle Big Muff on top of his tour board seen at the Bray Studios rehearsal in 2006. The extra screws on top (circled) are to mount the pcb of the Pete Cornish buffer built into the pedals. 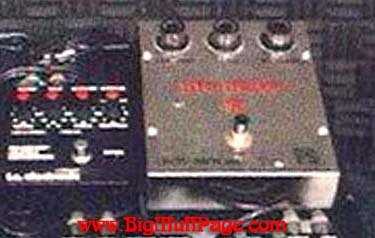 Shown above - A Ram's Head Big Muff on David Gilmour's 1984 pedal board. 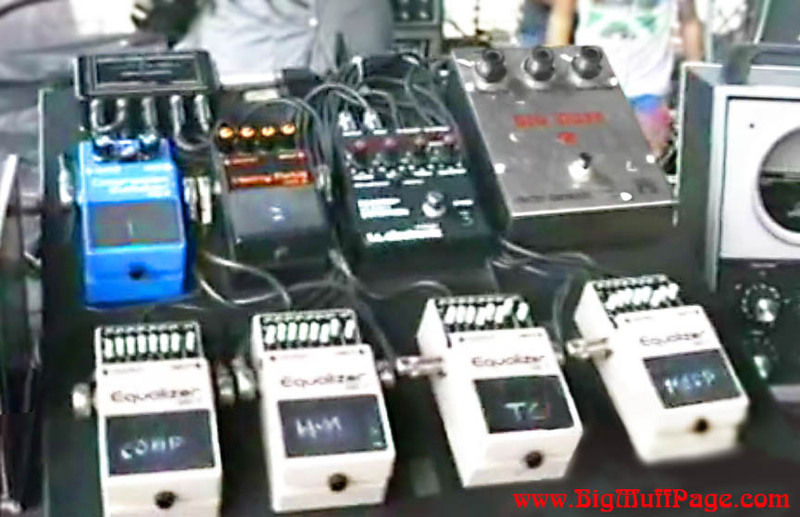 Shown above (left) David Gilmour's 2016 tour pedal board with his original 1974 Big Muff, with red LED added and DG ORIGINAL label. (right) Another Cornish modified Big Muff displayed at Pink Floyd's Their Mortal Remains exhibition in 2017. 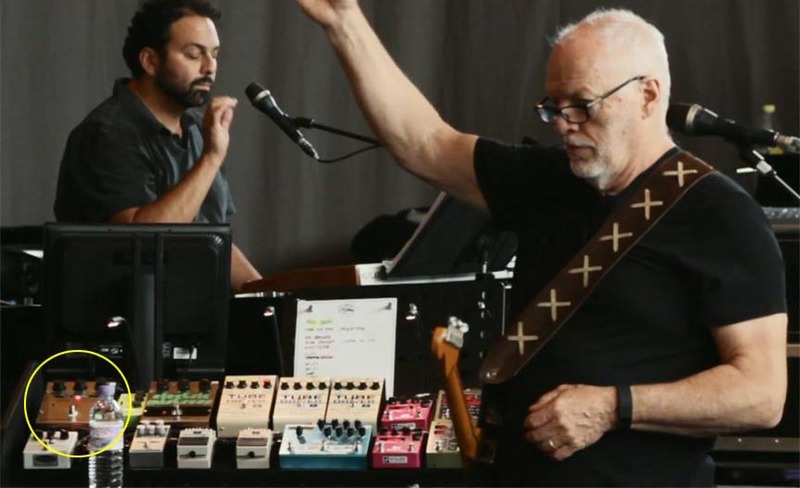 GILMOUR'S TRIANGLE BIG MUFF - David used a V1 "Triangle" Big Muff for part of his 2016 tour. It was used for the funky middle section of Echoes. 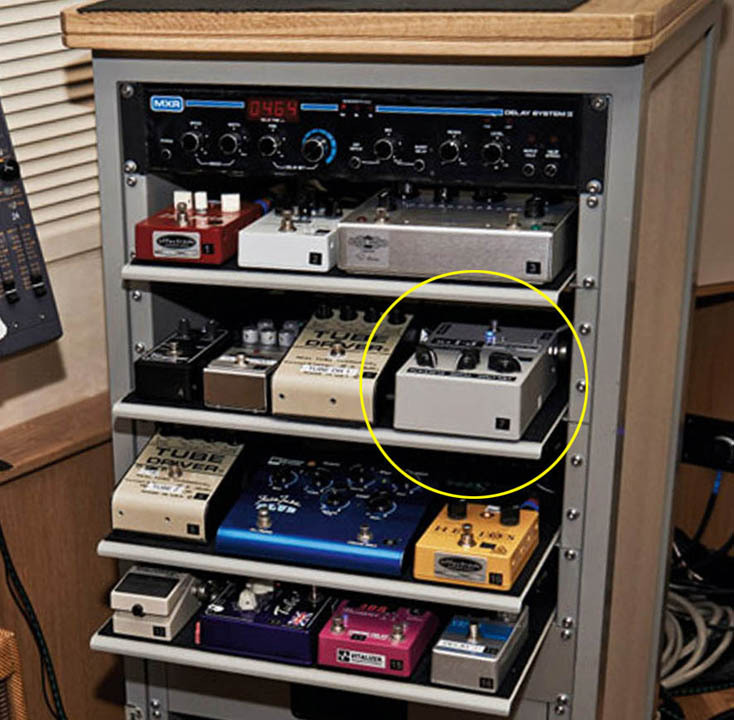 It is unknown if he has ever recorded in teh studio with a Triangle, but one was seen on a stestign pedal board in 2011 and in his Medina studio in 2017. 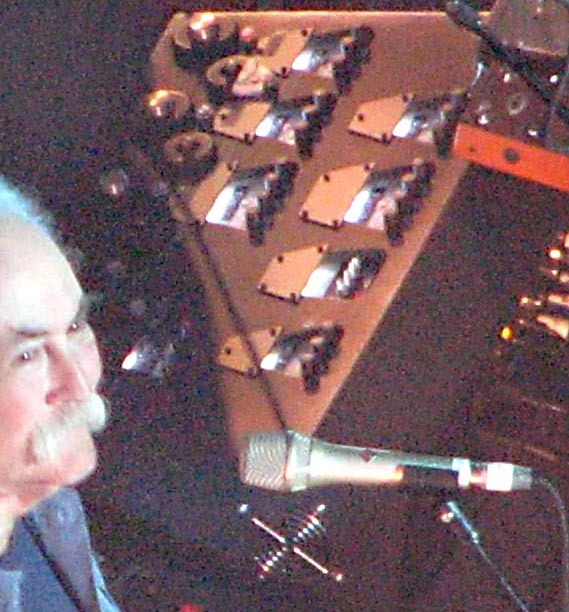 THE BIG MUFF CIRCUIT - Phil Taylor purchased several other V1 and V2 Big Muffs for David Gilmour throughout the mid 1970s, each with varying versions of the circuit inside. Why were there so many different variations of the circuit, you may ask? Well, Electro-Harmonix bought circuit components like capacitors and resistors in bulk to get the best prices, and often the value of the components from one bulk purchase were not exactly the same as the next. To accommodate this, they would simply revise the schematic to work with components EHX had on hand. Even though the topology of the circuit pathways (those silver lines you see on the back of the circuit boards) were exactly the same on all Big Muffs, it is the value and type of components used that defines the sound. This resulted in numerous versions of the circuit - over a dozen variants for the V1 Triangle Big Muff and nearly twenty for the V2 Ram's Head. Hundreds to thousands of each circuit variant were made. Some sounded only marginally different from the others, but several of these sounded significantly different. Most of them sound very different from the modern Big Muffs in production today. So which circuit was in David's #1 Big Muff? There were at least five Ram's Head variants in 1973, and four in 1974, so we can't know that without actually seeing the circuit. Shown above - selection of 1973-74 Big Muff circuits showing the wide variety of component types and values used, making them sound different from one another. Suffice it to say, those 1970s Big Muffs came in a very wide variety of sounds. 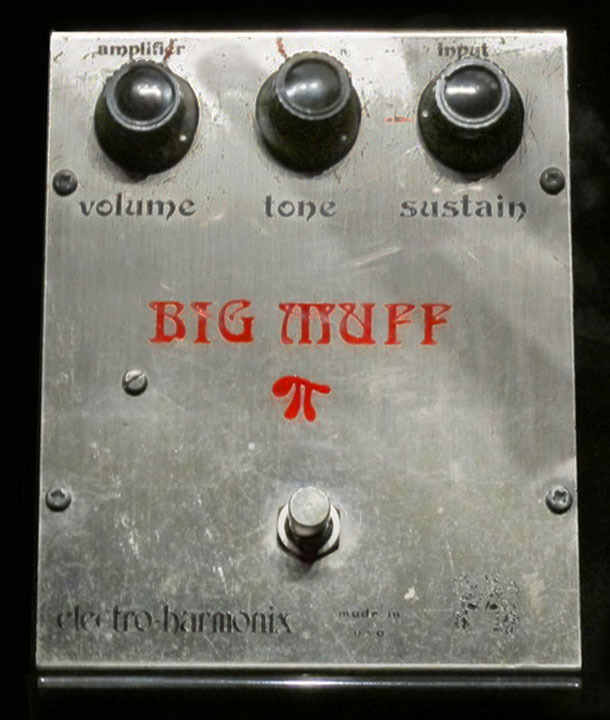 Although all had a distinct character that identified them as Big Muffs, the sound of those variants ranged from clear or muddy, fuzzy or crunchy, high gain or low gain, deeply scooped or moderately scooped mid range, chunky bottom end, or fat, thundery lows. Out of the many Ram's Head Big Muffs I have played, one of the few that really stands out among the others to me, and one that sounds exceptionally Gilmourish, is the Violet Big Muff circuit, manufactured around 1973-1975. It was a very common circuit variant from that period, with the typical huge, dark V2 sound, crunch, and grit, but it also had a clarity unlike many typical Ram's Heads and a tight low end. Another Big Muff circuit variant from the 1973 period, one I simply call the '73 Ram's Head or the Brick Muff, also reminds me of some of the more aggressive Big Muff tones I hear on the Animals tour and The Wall. However, the most accurate sounding 1973 variant I have played is an earlier one (schematic shown below). I have seen this circuit in the standard Ram's Head enclosure, as well as the circle face (all red color, all black, or all blue) logo version. It was also used in the Marveltone Distortion Sustainer, an OEM version of the V2 Big Muff made for Targ & Dinner in the mid 1970s. This circuit sounds very close to the Cornish P-1, leading me to believe this is what is in David's favorite Big Muff. THE PETE CORNISH "CUSTOM FUZZ" BIG MUFFS - David has occasionally used Pete Cornish custom made Big Muffs in his touring rigs. These are sometimes referred to as the Custom Fuzz, Precision Fuzz, Cornish Fuzz, P-Fuzz, or PC Big Muff in various Gilmour gear articles and books. They were all essentially custom made Big Muff circuits. Pete had some prior experience with the Big Muff before working with David Gilmour. In September 1973 he built a pedal board for King Crimson guitarist Robert Fripp that included a Guild Foxey Lady circuit, which was simply a rebranded triangle Big Muff made by Electro-Harmonix. Before going into more detail, let's get this out of the way. 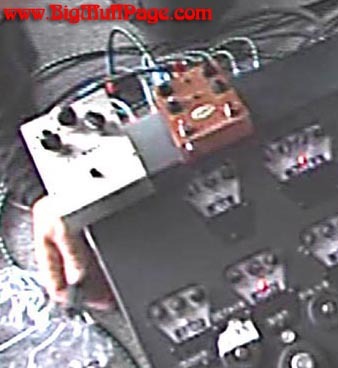 There is a popular belief that David was a heavy user of Pete Cornish effect pedals. 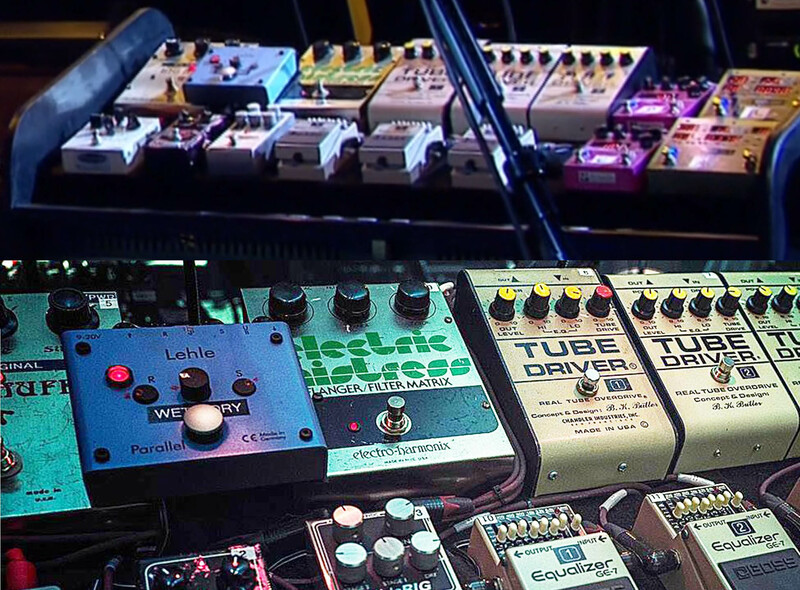 There have been a few Cornish effects built into his live rigs throughout the years, but those were mostly used as backup pedals or alternatives. How much actual use they saw is debatable, but Phil Taylor said this in a reply to a poster on David Gilmour's website blog, circa 2008, who asked "which delivers the 'true' Floyd tone, the Pete Cornish P-2 or the newer G-2?". The most well known of the Cornish custom fuzz pedals is his Precision Fuzz, or P-1 as it is known today, one of the first "boutique" custom Big Muff circuits ever made. Pete has given various accounts about when and how this originated. In a 1995 issue of Guitarist Magazine he said "March 7th, 1976 was when the very first drawings were done for the first board I built for Dave – that included a Cornish Custom Fuzz..." He has also said "The first version was called the Precision Fuzz and was unbuffered...The current P-1 is a buffered version of the original Precision Fuzz. Later after many mods and buffer additions for use a stand alone pedal it became the P-2. As these are gradual evolutions I don't have any specific dates." Based on what P-1 owners have told me, Pete has given many different accounts of when and how the Precision Fuzz originated. He has said the custom fuzz inside David's 1976 pedal board is the same as the P-1 sold today, said the P-1 was his first Custom Fuzz, referred to the P-1 as his "original 1982 Precision Fuzz," said the P-1 "is my 1982 version of the pedal currently known as the P-2 following several tonal/gain changes over the succeeding years," said the P-1 was "an exact clone of David's favorite Big Muff" and that his "work on the Muffs was done in January 1999...and you can purchase one any time you like - it's called the P-1..." He told me this account when I asked about the 1976 custom fuzz and P-1 origin - he was sent seven Big Muff pedals of various makes and models from Phil Taylor, David's backline tech. Each had a slightly different circuit inside giving each a slightly different sound, as was common at the time. Out of this group, Pete said he was asked to select the one he (Pete) considered to be the best and to reproduce the sound for David, but with the following improvements: add power supply de-coupling, add input/output buffers to maintain a constant high impedance signal load, improve the reliability, and reduce the PCB size, using the best components that were available at the time. 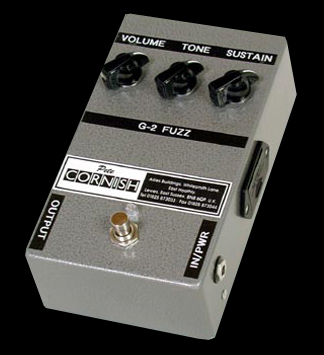 In 2006 Pete Cornish made a small run of a pedal version of the original Custom Fuzz/Precision Fuzz/P-1 to sell to other musicians, simply labeled as "Custom Design" on the enclosure. Another short run was made in 2008 when it was renamed the P-1. Eventually the P-1 was added to the regular Cornish pedal line in 2013. It included a high quality double buffer and was built in a sturdier enclosure than the stock Big Muff. Although Pete does not like to call what he makes "clones", the P-1 is very much a mid 1970's Big Muff circuit at its core, and a very good one. 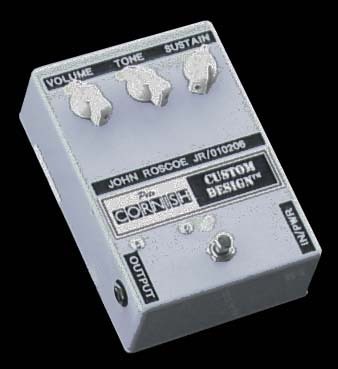 Having played the Cornish P-1for several years, I have found it to be remarkably similar in tone to some of my original 1973 era Violet Big Muff circuits, so I think the circuit component values are similar to one of those. The only notable difference is that the P-1 has significantly more gain on tap than the originals. 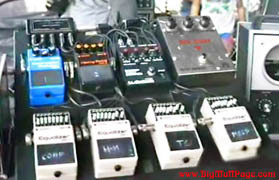 Big Muff replicas like the TopTone DG-1 (based on the Cornish P-2), Stomp Under Foot VRH, MJM Foxey Fuzz (both violet Big Muff clones), Wren and Cuff Caprid, and Electric Orange Pig Hoof have a similar sound. 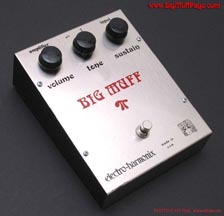 The Electro-Harmonix Deluxe Big Muff (2014 model) can also be set to sound very similar. Shown above, left to right - A pedal version of the original mid-1970's Pete Cornish Custom Fuzz. This one is owned by John Roscoe (ToneFromHeaven.com), and labeled "Custom Design". It was the first pedal version of the Custom Fuzz, built in 2006, and offered for sale to the public later that year as the P-1, shown on the middle. The one in the rack on the right belongs to David Gilmour, used in the control room of his Medina studio. These Cornish pedals have a plain, industrial look, but they are perfect for the hard life of a touring musician's gear, where all that matters is sound and reliability. 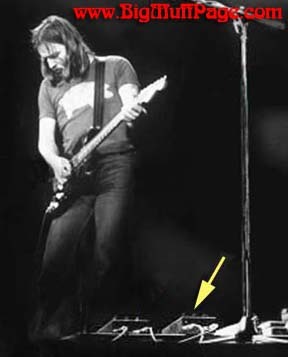 A photo from Pink Floyd's In the Flesh tour rehearsal taken in late 1976 shows David's touring Big Muff pedal on top of his large Pete Cornish made effects board. It was connected to the send/return jacks, along with an Electro-Harmonix Electric Mistress flanger. Tour photos from January through March 1977 also show the same touring Big Muff. 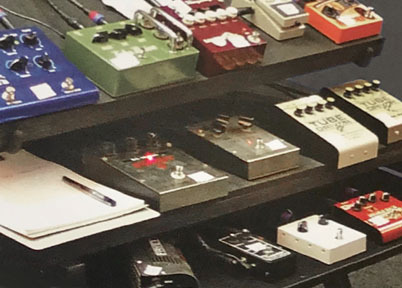 How much the Cornish Custom Fuzz/P-1 that was built into the board was actually used by David for the tour is unclear, as it seems to have been made primarily as a backup. David possibly used both for the tour, with different settings for each. 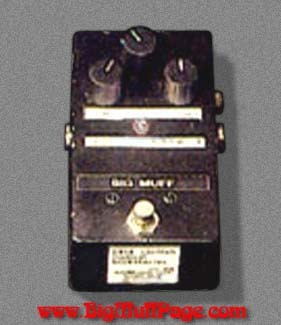 In late 1977 the Custom Fuzz/P-1 was removed from inside the pedal board and replaced with a real Big Muff circuit. Some have assumed the touring Big Muff used on top of the board was the same one later built into the board, but that is not correct. 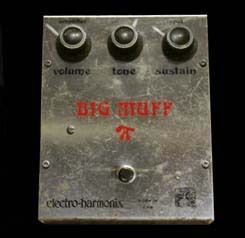 The touring Big Muff has been seen intact, in it's original enclosure repeatedly since 1977. 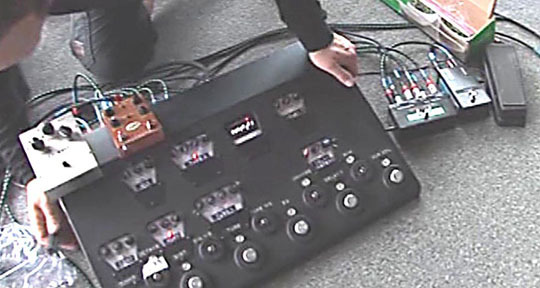 Pete does not simply drop a pedal into his custom pedal boards and plug it in. He removes the circuit from the original enclosure and integrates it into his pedal board power supply, buffers, and switching system. Pots have to be desoldered, power section altered, et cetera. My guess is this replacement was David's other Big Muff that was modified to match the sound of his original 1974 Big Muff, or simply another similar sounding stock Big Muff from David's collection. 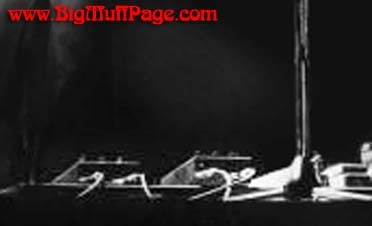 Shown above - Photos from January-March 1977 from Pink Floyd's Animals/ In the Flesh tour showing a "Ram's Head" Big Muff (right) and Electric Mistress (left) mounted on top of David's Cornish made pedal board during Pink Floyd's tour of Europe. These are the same Electo-Harmonix pedals seen in the London '76 rehearsal photo. 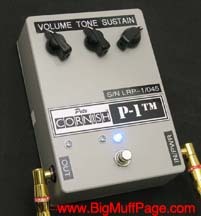 The pedal board also included a built in Cornish Custom Fuzz (P-1) for a short period. 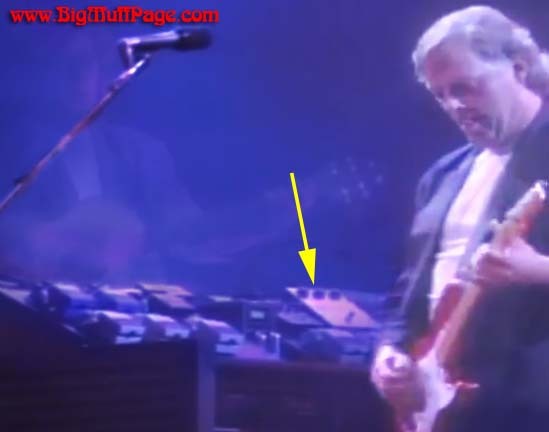 Even though the Cornish P-1 did not last long in David's 1977 pedal board, and seems to have been absent from Gilmour live rigs for close to 30 years, it made a return in the 2006 Cornish board used for David's stellar On and Island concerts, Documented in the Remember that Night DVD and Live in Gdansk CD and DVD. 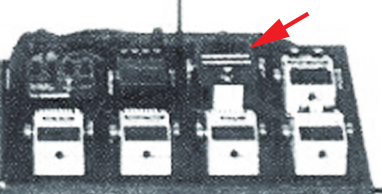 That said, I think David's primary pedal for that tour was the B. K. Butler Tube Driver, not the P-1. At some point after 1982 Pete created what he considered an improved version of the Custom Fuzz, with an improved tone control, less mid range scoop, and thicker lows. 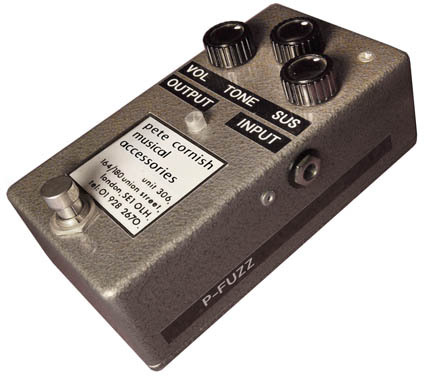 This evolution of the Custom Fuzz was called the P-Fuzz or Precision Fuzz in its early incarnations. It was housed in a small gray hammerite enclosure. David Gilmour had one in his giant 1988-89 Momentary Lapse of Reason touring rig, although it was probably only used for the 1989 leg. A version in a black enclosure replaced it for David's 1990 Knebworth rig. 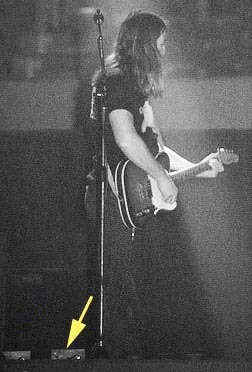 It appeared again for the Division Bell tour in 1994. 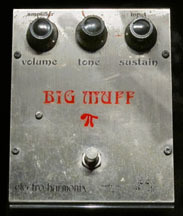 Simply labeled as "Big Muff", the pedal was probably used as a backup for David's Sovtek Big Muff, as it appears to have not been used for the main tour. It did not include Pete's buffer system, as David's custom pedal board already included the necessary buffers. 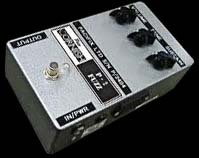 It was later re-named it the P-2 Fuzz. 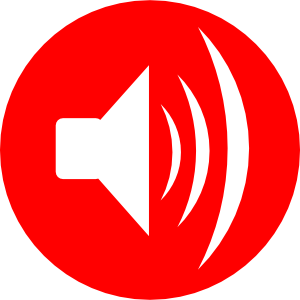 That version was offered for sale to the public with Pete's dual buffer system around 2001, and is now simply known as the P-2. Around 1992 Pete also made one for Lou Reed. There was yet a third evolution of the Big Muff circuit created by Pete Cornish, the G-2 Fuzz. This version sounded very different from the P-1 and P-2, utilizing Germanium diodes rather than Silicon found in most Big Muff circuits, and Pete's superb double buffer. Even though the circuit architecture is Muff based and uses the same pcb as the P-2, I would not even classify it as a Big Muff sound. The component values are heavily modified, giving the G-2 more of a very unique overdrive-dirt pedal tone, with a very smooth and warm, amp-like distortion. It was in David Gilmour's effects boards from 2002 until around 2010, probably as an alternative to the Tube Driver. It may have been used for the Pink Floyd Live 8 reunion in 2005, but David also had a Big Muff in his Cornish board. 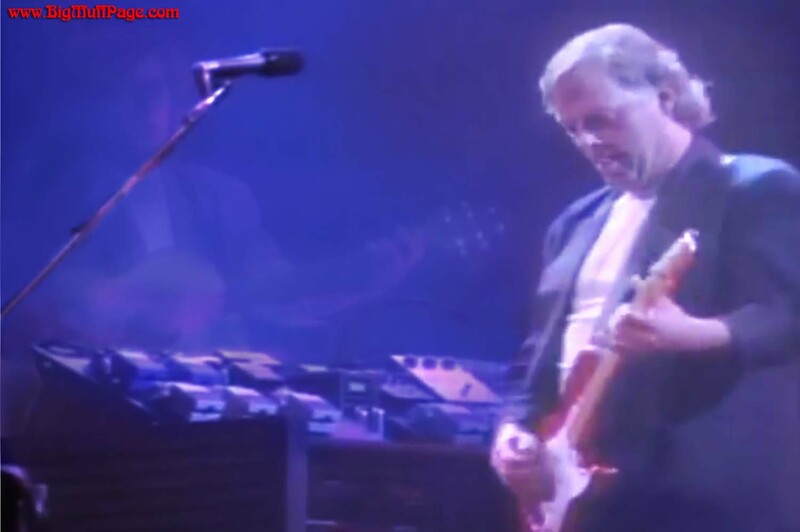 I believe most of the high gain guitar solos heard on Gilmour's Remember That Nght and Live In Gdnask DVDs were the Tube Driver, with the P-1 used for a few songs, like Comfortably Numb. I'm not sure the G-2 was used at all. 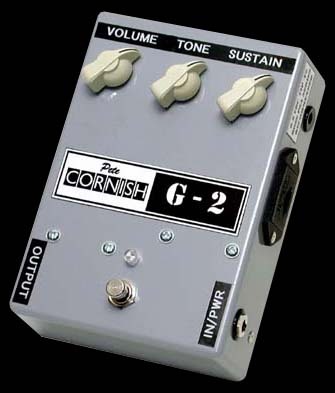 It is worth noting that each of these Cornish pedals originally included 'Fuzz' in the name, but after a debate began online about what constitutes as a fuzz pedal, muff, or distortion, Pete dropped the word fuzz and kept his simple alpha-numbering nomenclature as the name. Different people have different impressions of what "fuzz" means, but these circuits are all simply different ways of amplifying and distorting a guitar signal. A CONFUSION OF MUFFS - Since Phil Taylor had a second Big Muff modified in 1974 or 1975 to sound exactly the same as David's original 1974 Ram's Head Big Muff, I assume that is the one David used on the 1977 and 1987-88 tours. 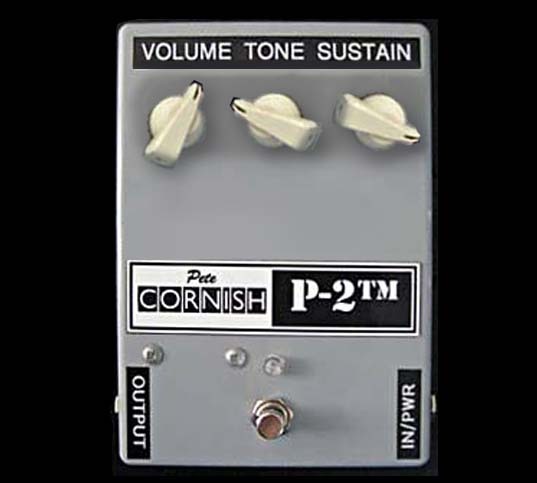 I would also assume the Cornish P-1/Custom Fuzz/Precision Fuzz sounds similar to David's original, but based on what Pete Cornish told me and others, that was not the case. However, according to Mike at AnalogMan, when he met with Phil Taylor in 2006 at one of Gilmour's On An Island concerts in New York, he got the straight scoop about David's Big Muffs. According to what Phil told Mike, the Cornish Custom Fuzz built into David's second pedal board sounded exactly like David's original 1974 Big Muff. According to an account I was told from someone who visited the Cornish shop, the schematic he was shown of the Big Muff circuit Pete Cornish traced for for the P-1 even has "David's favorite Muff" written on it. This begs the question - If the original custom fuzz sounded exactly like David's original, why was it replaced and why did David use one of his original Big Muffs on tour so often? There are also several other Big Muffs used in David's later Cornish made pedal boards - the revised 1978 Animals board, The Wall recording studio board, the small Wall touring boards, and the 2006 Cornish made Mk I all-tube buffered board. Each lists a Big Muff as a built in effect. These are usually labeled "Big Muff" in the effect chain lists from Pete Cornish and other sources, and labeled "Muff" on the pedal boards. The P-1 was originally labeled as a Custom Fuzz. We do not know if these were stock Big Muff circuits, or simply more circuits modified to sound exactly like David's original. Any Big Muff at this time could have been modified to sound similar to another. It simply required using the same value resistors, capacitors, and similar diodes and transistors. Granted, the components had sloppy tolerances at the time, so to make an exact clone, each component needed to be measured to get the exact values, and use components of the exact same type. Even using the values marked on the components without measuring, one would get very close. Phil Taylor could have had any number of stock Big Muff circuits modified in this manner for David, all having his preferred sound. 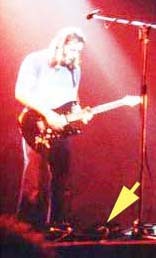 Shown above - Bob Bradshaw photos of David Gilmour's 1987 touring rig with a Ram's Head Big Muff on the upper right of the pedal board. 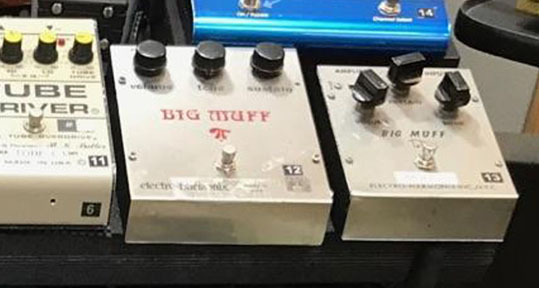 This is the same touring Big Muff seen on top of the Animals pedal board in 1977 (Thanks to John Roscoe, host of Tone From Heaven and Bob Bradshaw for the photo). 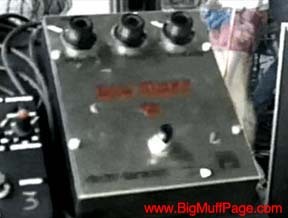 Shown above - Video captures of the touring Big Muff with black foot switch from a 1987 back stage tour crew film. Note the white tic marks indicating David's settings. 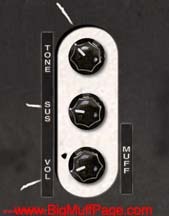 The original EHX pots (potentiometers) and knobs were aligned differently from each other, and the tone pot was wired in reverse of modern Big Muffs. 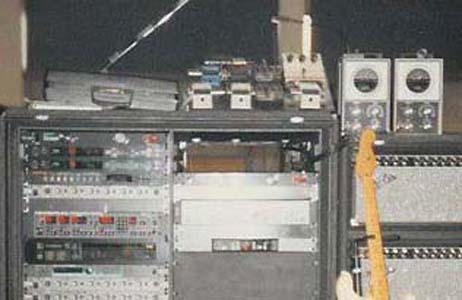 Pete Cornish aligned and wired all of the pots in the same modern orientation when he replaced them, so below are the actual 1987 settings for the Momentary Lapse of Reason tour. Tone: 1:00 / 60% (treble left, bass right). Note that the sustain is relatively low on the Big Muff, and using the muff alone will not get you very close to some of the high gain lead tones heard on the tour. That is because David often blended the Big Muff with an overdrive to smooth out and EQ the tone, as well as using a Boss GE-7 to fine tune the EQ of the Muff. For this tour he used a TC Electronic Booster + Line Driver & Distortion (BLD) and a Mesa/Boogie rack head to blend with his high gain distortions, like the Muff. 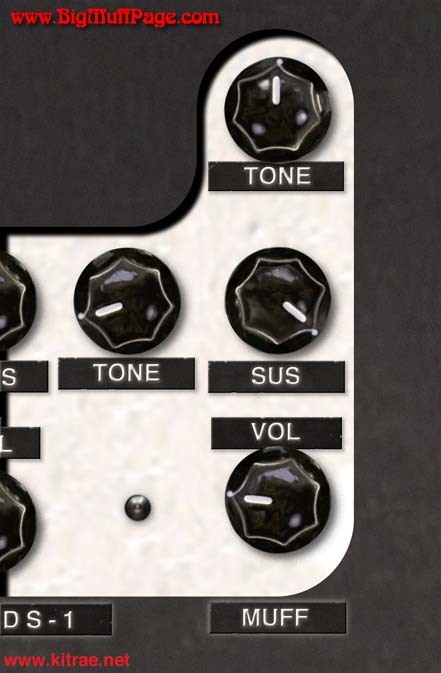 The gear and settings above are what I use to replicate those tones with the Big Muff. Shown above - The photo on the left is from the 1988 Pink Floyd tour, showing the touring Ram's Head. 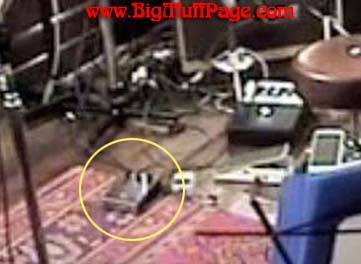 In the middle is a blurry screen capture from DavidGilmour.com of what appears to be a Ram's Head Big Muff, spotted on the floor of Davids Astoria floating recording studio during the On An Island recording sessions in 2006. 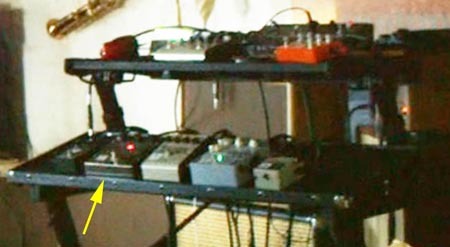 To the right is another 2006 screen grab of David's Triangle Big Muff from the Remember That Night DVD. Kit’s Secret Guitar, Gear, and Music Page and the Big Muff Page are a personal fan site. Information and materials from this website are intended for personal use only and may not be linked to via the internet/world wide web, republished, reproduced, re-written, reprinted, rebroadcast, disseminated, and/or duplicated in whole or in part, for commercial or any other purposes whatsoever and is strictly prohibited without prior WRITTEN consent from the publisher at www.kitrae.net. This is a personal fan site and is not affiliated in any way with Electro-Harmonix, Pink Floyd, any of its past or present members, their record label(s), or Pink Floyd Music Ltd. This is not an official Pink Floyd or Electro-Hrmonix website. Please see http://www.pinkfloyd.co.uk for Pink Floyd's official website. "Pink Floyd" images and music are licenced under the trademark of Pink Floyd Music, Ltd. Please see http://www.ehx.com for the official Electro-Harmonix website.